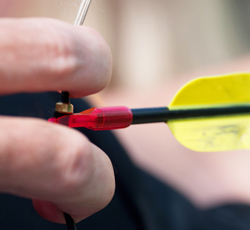 Great Endings #9 Does your screenplay have a bow and arrow moment? In preparing for a class on Juno, I read the published screenplay and when I reached the climax, something strange happened. I’d loved Juno the film but I didn’t recall being especially moved by the ending. So I took another look at it and discovered two things. Firstly, it didn’t move me as much as the screenplay. And, then I saw that the film differed from the script. The scenes were roughly the same but the director had fiddled with the order and, in the process, killed the emotional power of the ending. What was the key difference? In the screenplay, the tension was built and released in one swift action, while, in the film, the tension was dissipated gradually across several scenes. (For a more detailed exploration, read this earlier post on why Juno the script is more moving than Juno the film). This crystallised for me how critical it is to not just build tension, but to play close attention to the way in which it’s released. If they are able to give me a crisp, concise answer that culminates in a decisive moment, then I’ll know they’re in good shape. If they’re still talking 5 mins after I ask the question then I know they’re in deep trouble. “Well, then she does this, then she builds a Yurt to express her love, and then they plant a field of canola, and then they harvest it, yada, yada”. Climaxes cannot be fragmented – not if you want to move the audience, and that, ultimately, is what we’re trying to do. In order to deliver this profoundly moving experience, you need to build the tension, and build it a little more, and then build it until it’s impossible for us to bear it any longer and then … release it, in one swift action. Like a bow and arrow. Remember what it was like at high school or university to be approaching your final exam period. You might have been facing 8 or 10 exams over a couple of weeks and you thought, oh, no, how horrendous. And how great it was going to be when it was all over?!?!? But, when you’d finished all your exams, it felt pretty good, but not quite as good as you thought you’d feel. Why? Because the pressure had been released gradually. The bow was pulled back as far as it would go before the first exam, but then, with each successive exam, the tension was released a little, and a little more, until, by the time you got to the last exam, there wasn’t a whole lot of power left in that bow. Instantaneously, the tension comes off – the arrow spirals off into the distance – and the sense of elation in your body is extraordinary. We need to heed the lessons of these examples in shaping our stories. If we want to give our audience this emotional rush, we need to release the dramatic tension in one swift action. The great films do this and this is how they do it. In the climactic scene, the hero will typically stand on one side of a metaphoric line, a line that leaves us in doubt about whether they are going to draw on the lessons they’ve learned in the story and address the flaws they’ve been confronted with. And, on the other side of the line, stands their Higher Self, beckoning them to come across. Will they come across that line? Will they have the courage? Can they display the compassion? If and when they do – whooooosssh! – the arrow catapults off into the stratosphere and you get that instantaneous release of emotional power. Like when Todd in Dead Poets Society steps up onto that desk and declares, “Oh, Captain, my, Captain!”. 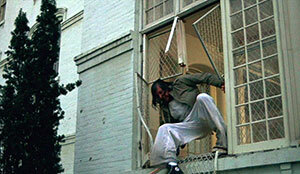 Like when the Chief in Cuckoo’s Nest takes that bathroom unit and hurls it threw the window. Like Thelma and Louise do when they look at one other, put pedal to the metal, and drive off that cliff. Like Scott does in Strictly Ballroom, when, instead of dancing the Federation Steps, he assumes that dramatic matador pose that tells us that he is going to dance the Paso Doble. Like Richard does in Little Miss Sunshine, when, instead of being the dork he’s been for most of the film, he chooses to dance like his daughter, Olive. Like Lars does in Lars and the Real Girl, when he turns to Margo at Bianca’s graveside, and asks, “Do you want to go for a walk?”. In The Lives of Others, because it’s a tragedy, it’s slightly different. The hero takes the decisive action, things look fine, and then whack – our hearts are shattered. But, again, the emotional effect is achieved through one swift, instantaneous action. Similarly in The Godfather, the door swings closed on his wife, and Michael’s regression is complete. In all of these films, there is a Bow and Arrow moment. The tension that has been built is released in one swift action. What you don’t want to do is pull the bow back, and pull it back a bit more, and pull it back as far as it will go, then say, oh, actually, that’s a little bit too far back, let’s just release that tension a little bit, and a little bit more and a little bit more, and now let’s release it. Dead arrow. Dead climax. Dead film. To further illustrate the point, have a think about The King’s Speech. What’s the most moving moment in The King’s Speech? For me, the climax – the delivery of the speech – is not the most moving moment in The King’s Speech. Not by a long shot. The most moving moment is when, after being goaded by Logue (Geoffrey Rush) about why he should respect his regal authority, Bertie explodes, “I have a voice!”. That for me is profoundly moving. The tension is built, the bow is pulled back further and further and then – release – in one swift action. By contrast, I’m not moved nearly as much by the speech. I just don’t feel it. Why? Because the tension is not released in one swift action. Where is the finish line? When can we feel safe? When can we feel relieved? The middle? But he’s still talking. He could still stuff it up. When he’s finished? Well, that’s a bit like those exams. It feels good, but not as good as I thought it would feel. I’m not saying this as a criticism. Or that I would necessarily change anything. I’m just making an observation. The “I have a voice” moment in The King’s Speech moves me more than the climax that’s highlighted in the title and I can see why that is. In one, there is a swift release. And in the other, the tension is dissipated gradually. I think if we’re smart and we want to understand how story works, we shouldn’t be ignoring stuff like that. When our feelings tell us something, dig a little to discover why. Novice screenwriters tend to think that writing involves typing stuff into FinalDraft. If they’re not writing sluglines and tapping in dazzling dialogue, they’re not really writing. Big mistake. Writing is not just typing the screenplay. Writing, first and foremost, is shaping the story. It’s rolling around options in your head or on scene cards or on the white board, as you try to manoeuvre characters and scenarios into a sequence of emotional shifts that will ultimately profoundly move your audience. And the critical moment is the ending. What happens at the climax of the film to release the tension of the previous 100-odd pages? Do you release it in one swift action or not? Previous post: Great Endings #8: What does your hero sacrifice?